Jailed Catalan activist Jordi Sanchez has dropped his bid to lead the region's government, paving the way for separatist parties to offer a new name. The move comes after Spain's Supreme Court rejected his request to be freed to attend an investiture ceremony. Mr Sanchez, 53, is being held on sedition charges following October's independence referendum, which was ruled illegal by the Spanish courts. Separatist parties won a slim majority in regional elections in December. The central government called that vote when it sacked the regional administration and imposed direct rule after the Catalan leaders at the time declared independence. Mr Sanchez, the former leader of the pro-independence movement Catalan National Assembly, was nominated by separatist parties after the former regional president, Carles Puigdemont, abandoned his attempts to be reappointed. Announcing Mr Sanchez's decision, Catalan parliamentary speaker Roger Torrent said he faced "repeated violation of his fundamental rights". Mr Torrent said he would start talks to find a new candidate to lead the government. One possible name is former Catalan government spokesman Jordi Turull, who is also under investigation over his role in the independence movement. Twenty-eight Catalan politicians are being investigated by a Supreme Court judge for their role in the banned referendum and subsequent declaration of independence. 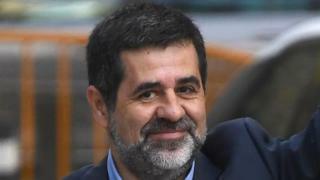 Mr Sanchez and three others remain in jail: former Catalan Vice-President Oriol Junqueras, ex-Interior Minister Joaquim Forn and grassroots separatist leader Jordi Cuixart. Meanwhile, Mr Puigdemont remains in Belgium, fearing arrest if he returns. This is Spain's biggest political crisis since democracy was restored to the country in 1975.